The first thing I did when I migrated from being a history teacher to being a teacher of students with emotional behavioral disorders was join CEC and CCBD. The first thing I did when I moved from being a teacher to being a coordinator was to add CASE to my membership. WHY? Because I knew that no matter how much I thought I knew about leading special education programs, I didn't know it all! I knew there were colleagues with more experience who could teach me so much, but I needed to have access to them, I knew there was no way I could keep up with the trends, issues, legal changes, etc all by myself — I needed CASE! Even though that was 1982, I promise you I need CASE just as much now as I did then! One of the goals I had when I took the position as Executive Director of CASE was to continue to work towards the development of and promotion of new resources to meet the needs of all the current, new, and future directors. The Winter Hybrid conference is an example of new resources as is the CASE Leadership Series. The Leadership Series will be a seven (7) book series developed with the idea of providing targeted content for new or experienced special education leaders. We have been so proud of the first two books, "The Journey to Effective Leadership" (Dr. Christy Chambers) and "Trends and Issues Affecting Education and the Provision of Special Education Services" (Dr. William Bogdan) and are very proud to announce the third book in the series: "Organizational Change: Transformative Leadership for Special Education" by Drs. Stevan Kukic and Harvey Rude is now available for purchase! Click here to go to the CASE website store to purchase your copy of this amazing book on organizational change! Be sure to take the CASE Poll below and you will see the content of the 7 books in the series. Is there a topic/skill set that is missing? 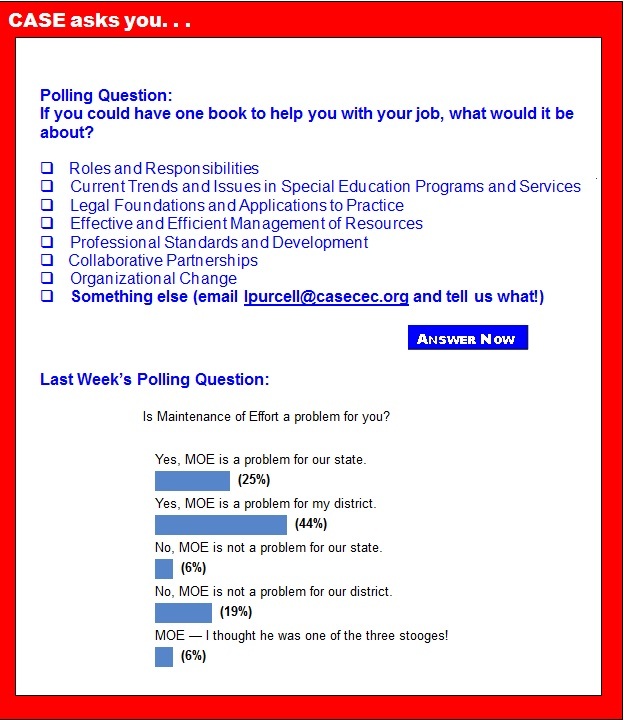 Let us know by emailing your suggestions to lpurcell@casecec.org or to Michael.Remus@dvusd.org, co chair for the products and publications committee. We are always looking for new ways to meet your needs, but we need to have you communicate to us what your needs are. Go to the CASE facebook page, email the CASE leadership or tweet to us — but find a way to let us know what you want and need! CASE is your professional association — help us continue to make it better! 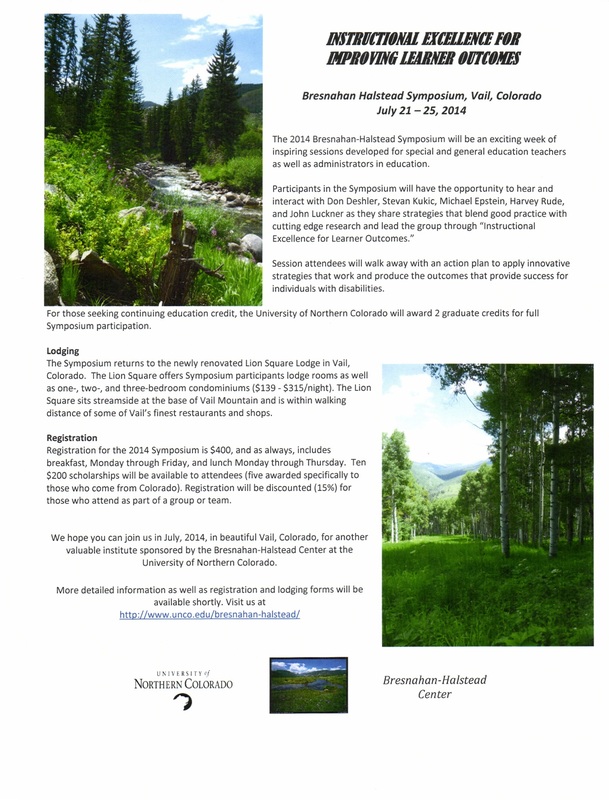 The Bresnahan-Halstead Center at the University of Northern Colorado is sponsoring a week long Special Education Symposium the week of July 21-25 at the Lion Square Lodge in beautiful Vail, Colo. Participants in the Symposium will have the opportunity to hear and interact with Don Deshler, Steve Kukic, Michael Epstein, Harvey Rude and other presenters who address the topic of: "Instructional Excellence for Improving Learner Outcomes." Session attendees will walk away with an action plan to apply innovative strategies that work, and produce the outcomes of results and learning for individual learners, including those with disabilities. To receive additional information, please contact Bresnahan-Halstead Center Business Manager, Lorae Blum at Lorae.Blum@unco.edu, click here [link to attached pdf] for a brochure, or visit our website at: http://www.unco.edu/bresnahan-halstead. Over 1,000 special educators from every state echoed the same message in a just-released survey conducted by CEC and the National Coalition of Personnel Shortages in Special Education & Related Services: budget cuts are impacting services for students with disabilities. CEC celebrates the United Nation's International Day of Persons with Disabilities with the 2013 theme: Break Barriers, Open Doors! As we commemorate the improvements for individuals with disabilities in recognition of both civil and human rights, we know there are still many who face physical, social, economic and attitudinal barriers that exclude them from being recognized and respected as equal members of society around the world. Resources created by the National Dissemination Center for Children with Disabilities — widely known by the acronym NICHCY, a holdover from the name it had over 30 years ago — will remain available online, though the center closed down after its last grant from the Department of Education's office of special education programs ended in September. Children begin learning to read early in their education. Very often, some children seem to excel at reading and writing, while others may struggle. The obstacles kids struggle with may disappear as they age and grow more accustomed to reading, but no such relief comes for kids struggling with dyslexia. The Mayo Clinic defines dyslexia as a learning disorder characterized by difficulty reading. It is a common condition and does not mean a child has subpar vision or intelligence. Dyslexia often goes undiagnosed, and many kids reach adulthood before realizing they are dyslexic. According to Dyslexia Health, 70 to 80 percent of people with poor reading skills are likely to be dyslexic, and dyslexia is the most common cause of difficulties with reading, spelling and writing. One of the signature findings of the cognitive revolution of mind, brain and education research over the last few decades has been the overwhelming recognition of the tremendous diversity of human brains. In our population of students, there is a stunning variety of talents and capacities, and some of our peculiarities are both great strengths and weaknesses. For instance, an incredibly high proportion of the world's leading astrophysicists are dyslexic. As it turns out, in the complex architecture of the brain-eye connection, some of us have very strong central vision, while others have very strong peripheral vision. The Democratic Party's top think tank is urging lawmakers to accept nothing short of ending sequestration during upcoming budget cuts. The Center for American Progress, a group with strong ties to the Obama administration, will release a report on Thursday detailing damage caused by the sequester's across-the-board budget cuts and warning lawmakers the havoc will worsen dramatically if the cuts remain in place for another year. A dozen states have applied for extra flexibility from the U.S. Department of Education to give them another year of wiggle room as they roll out new teacher-evaluation systems. And 15 states have asked federal officials for a special waiver so they can give fewer tests to students, the department announced. States including Maryland, Kentucky, and North Carolina want to delay, by one year, tying teacher evaluations to teacher personnel decisions. That's something federal officials offered back in June as states struggled to implement new common standards, new tests, and high-stakes teacher-rating systems that tie personnel decisions to student growth. Remembering the plot of a short story is no longer good enough in teacher Amy Lawson's fifth-grade classroom. Today's students are being asked to think more critically. For example, what might a character say in an email to a friend? "It's hard. But you can handle this," Lawson tells them. Welcome to a classroom using the Common Core State Standards, one of the most politicized and misunderstood changes in education for students and their teachers in kindergarten through high school. Resources created by the National Dissemination Center for Children with Disabilities — widely known by the acronym NICHCY, a holdover from the name it had over 30 years ago — will remain available online, though the center closed down after its last grant from the Department of Education's office of special education programs ended in September. The center, once known as the National Information Center for Handicapped Children and Youth, had for decades provided direct resources to parents through mail and a telephone hotline. Take a moment to think about how you learned to write. What steps did you go through? What was your process? Most of us learned the same core set of skills on paper: organize, draft, edit, revise, turn in. Our teachers then marked up what we had handwritten or typed, and returned our writing. From there, maybe it ended up tacked to a bulletin board, stuck on the refrigerator door, stuffed into a notebook or tossed in the nearest trash can. A new survey by an education marketing organization finds that school districts are making a top priority of shifting materials, instruction and assessments to reflect the Common Core State Standards. That's not too surprising, of course, given that all but four states have adopted the standards. But it offers yet another thermometer of sorts to measure the level of attention and activity around the new standards. When fourth-grader Abby Ahrens boards her school bus in this Cincinnati suburb, she thrusts out a white card as she passes a small computer screen next to the bus doors. It beeps, and the monitor lights up briefly. Her mother gets a text message saying her daughter has made it onto the bus. The same thing happens when Abby gets off the bus at Dater Montessori School in Cincinnati, so Mom knows that Abby has arrived safely. The ZPass program, a partnership between Cincinnati Public Schools and First Student bus company, is billed as a tool to inform parents and improve ridership data. But it's also one way schools are trying to keep tabs of their students — often to track attendance.